Incorporate your love of birds into your home d�cor with these Anthony Stoneware French Blue Dove of Peace Dishes. These 3, fired stoneware vessels are perfect for placement throughout your home, and their varied blue tones bring a wonderful contrast to any setting. Upwardly extended wing shapes and a forward appearing gaze create a familiar dove figure, and the depressed center is perfect for holding change or jewelry. A generous ring at the base of each dish allows them to rest on a level surface easily, and depressed lines inside each item add striking detail. The units are fantastic and versatile home adornments, and the stoneware construction remains durable for use season after season. 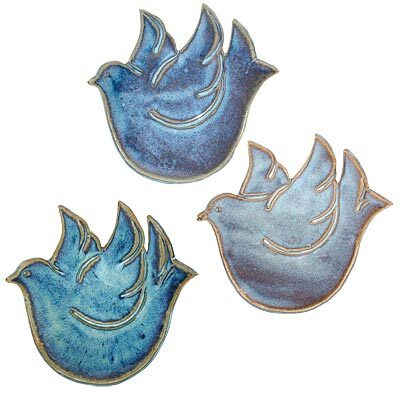 Celebrate birds in your home with these French Blue Dove of Peace Dishes. Made in the USA. Note: This package contains 3 of the Anthony Stoneware Dove of Peace Dishes, French Blue. Due to their handcrafted construction, each unit may vary slightly in terms of finish and size.